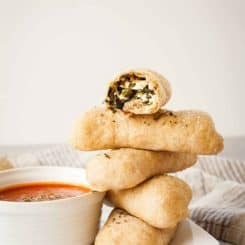 These Spanakopita Pizza Dippers take everything you love about the Greek spinach and feta dish and put it in crowd pleasing pizza dough, ready for dipping in your favorite marinara sauce! Today we’re doing a food culture mash up! Which is, admittedly, a little risky these days. There will likely be plenty of people letting me know that spanakopita is supposed to be made with phyllo dough. And while I know that, I really just wanted to stuff spinach and feta inside pizza dough and dip it all in rich, tomato-y marinara. These spanakopita pizza dippers maybe aren’t the prettiest thing I’ve ever shared, they sure are good, and easy! My favorite pizza dough is the same one I use on my onion and green pepper pizza, or you can go the extra easy route and use store bought. I’m also going to highly encourage you to find the best feta cheese you can. I like the stuff that comes packed in water in a little container, or at the very least a big block that you crumble yourself. While all feta cheese is basically magic, you’ll get the best texture out of something that’s not sitting around pre-crumbled. Another tip involves frozen spinach. I always thaw it on a plate in the microwave, then place it in a clean kitchen towel. Twist that baby up over the sink and squeeze until it stops dripping. That’ll keep your filling from getting too wet. 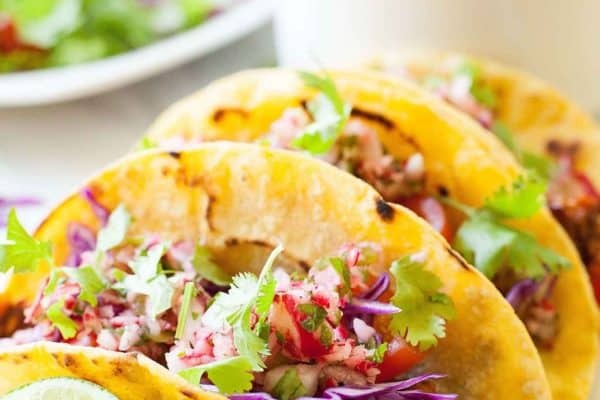 If you make this, be sure to rate it, leave a comment, or tag #theliveinkitchen on Instagram! Spinach and feta wrapped in pizza dough, dipped in marinara sauce. Preheat the oven to 450ºF. In a medium bowl, combine spinach, feta, nutmeg, and salt and pepper to taste. Roll pizza dough out into a large, thin rectangle. Cut into about ten equal pieces. 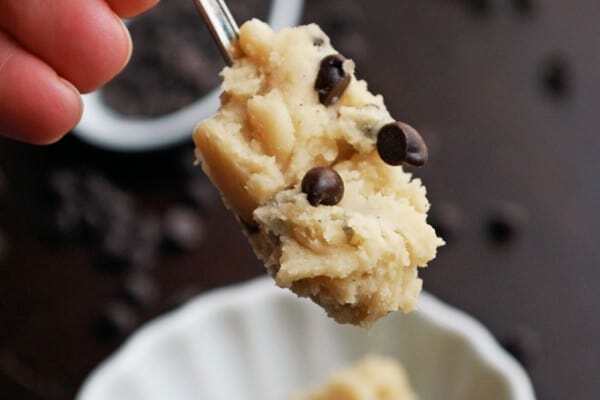 Divide the filling mixture amongst the dough squares. Place water in a small bowl. Using two fingers, dip them in the water and dab all around the edges of each dough square. Fold up the bottom of a piece of dough, then fold in the sides, and stretch the top over the filling, pinching the dough to seal any openings. Gently roll the dipper to seal, shape, and evenly distribute the filling. Repeat with the remaining dippers and place on a baking sheet. Brush the dippers lightly with olive oil, then sprinkle lightly with dried oregano and coarse kosher salt. Bake 12 minutes or until the dough is beginning to crisp and brown. While the dippers are cooking, heat the marinara in a small pot over medium low heat. Serve dippers with small bowls of marinara for dipping. Wow, what a great idea! Gotta make this one. Thanks for the recipe.